To reduce NOx emission, part of the exhaust gases are recirculated through the EGR valve to the intake manifold to lower the maximum combustion temperature. ••When the throttle valve is positioned above the R port, the EGR vacuum modulator will close the atmosphere passage and open the EGR valve to increase the EGR gas. even if the exhaust pressure is insufficiently low. 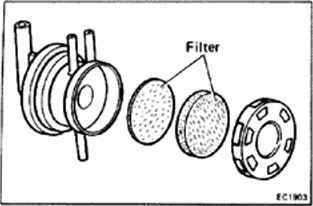 (a) Check the filter for contamination or damage. <b) Using compressed air, clean the filter. 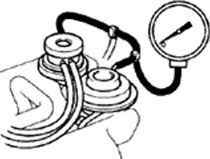 Disconnect the vacuum hose from the EGR valve and, using a three way union, connect a vacuum gauge to it. Start the engine and check that the engine starts and runs at idle. (a) The coolant temperature should be below 57°C (135°F). (b) Check that the vacuum gauge indicates zero at 2,500 rpm. (b) Check that the vacuum gauge indicates about 70 mm Hg (2.76 in.Hg, 9.3 kPa) at 2r500 rpm. (c) Check that the vacuum gauge indicates zero at idle. 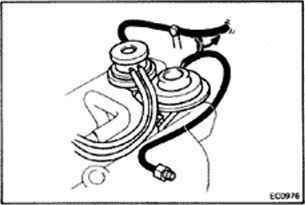 (d) Disconnect the vacuum hose from R port of the EGR vacuum modulator and connect R port directly to the intake manifold with another hose. (e) Check that the vacuum gauge indicates high vacuum at 2,500 rpm. 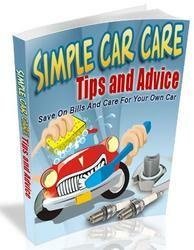 NOTE: As a large amount of EGR gas enters, the engine will misfire. (f) Disconnect the vacuum gauge and reconnect the vacuum hoses to the proper locations. 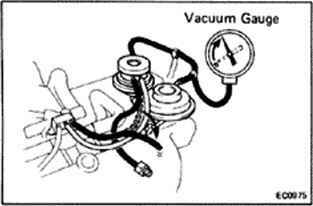 (a) Apply vacuum directly to the EGR valve with the engine idling. (b) Check that the engine runs rough or dies. 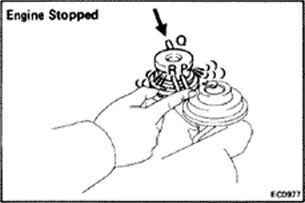 (c) Reconnect the vacuum hoses to the proper location. 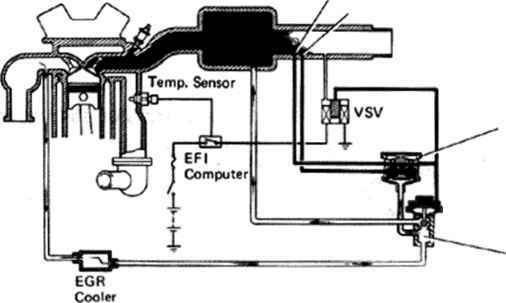 (a) Disconnect the vacuum hoses from ports P, Q and R of the EGR vacuum modulator. (b) Block ports P and R with your finger. (c) Blow air into port Q. Check that the air passes through to the air filter side freely. (d) Start the engine and maintain engine speed at 2,500 rpm. (e) Repeat the above test. Check that there is a strong resistance to air flow. (f) Disconnect the vacuum hoses to the proper locations. 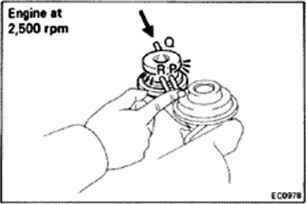 If a problem is found, replace the EGR vacuum modulator. 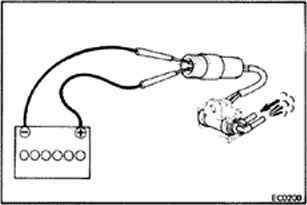 (a) Connect the VSV terminals to the battery terminals as illustrated. (b) Blow air into a pipe and check that the VSV is open. (d) Blow air into a pipe and check that the VSV is closed. If a problem is found, replace the VSV. 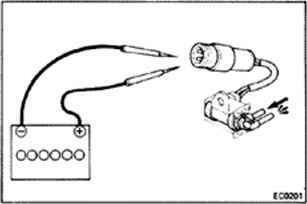 Using an ohmmeter, check that there is no continuity between the terminals and the VSV body. If there is continuity, replace the VSV. 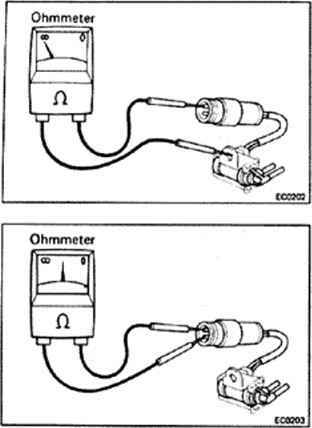 Using an ohmmeter, measure the resistance between the terminals. If the resistance is not within specification, replace the VSV. Check the valve for sticking and heavy carbon deposits. If a problem is found, replace it. How to clean 2000 camry EGR modulator filter? 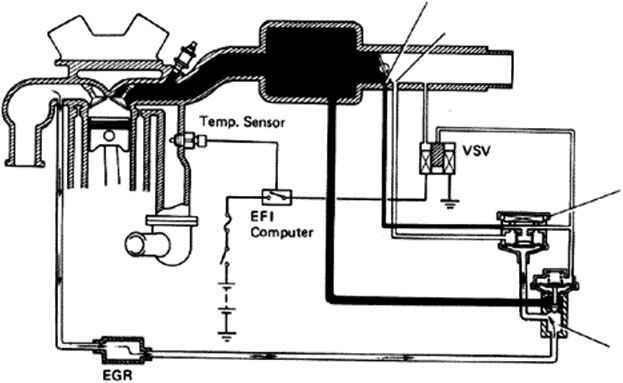 Where to connect the vacuum gauge to idle mixture? How to clean a modulator egr filter toyota camry le 2000? 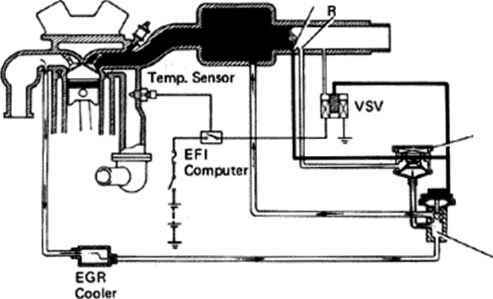 Where is the coolant temperature sensor on a 1997 toyota celica gt? Where is the heat sensor on toyota celica? How to install closed circuit for Toyota Land Cruiser 2002? Where is temperature sensor on toyota camry 2001? How to hook an egr valve to the exhaust in an 2001 toyota camry? 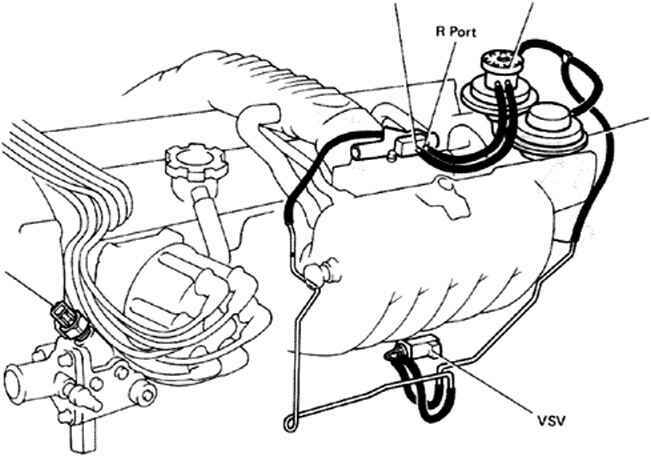 Where is the low side pressure service port in toyota rav4? How to clean carbon in the air system flow in toyota avalon 1996? 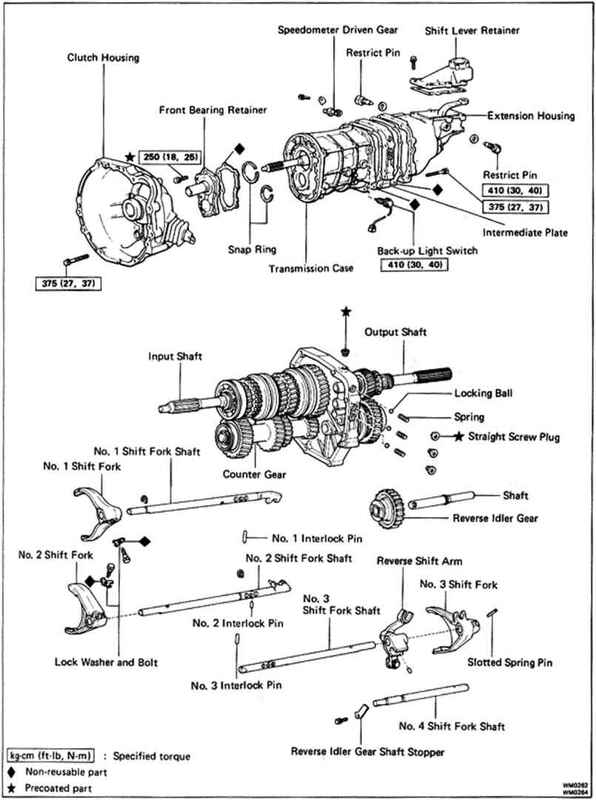 Where is EGR located on 1998 Toyota Camry? Where is the exhaust gas recirculation valve situated?